I need to read through my emails better. Especially when it’s written in Korean, I tend to just glaze over and that gets me into trouble. 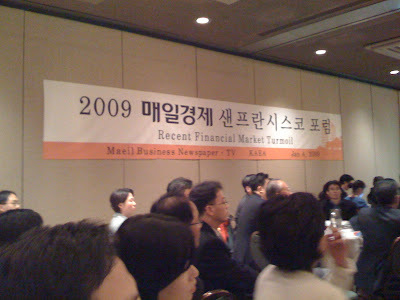 Anyhow, there was an email from Bayarea K Group about some economic forum being held in SF, sponsored by a so-called “Wall Street Journal of Korea.” I didn’t realize what it was about, but I later found out that it was a part of annual meeting by KAEA (Korean American Economic Associations). The forum was a panel discussion and there were three panelists, one Korean British and two Americans (one of them Berkeley professor). They all talked about what went wrong and what “definitely” caused today’s economic downturn. Though, it was quite educational, none of the three could predict when and how the economy would get better. They couldn’t even agree on what monetary or federal policies should be implemented to jump start the economy. When economists do not know, then you know we are in deep sh*t. There were a few things they agreed such as stimulus plan, what kind and how. But, I wanted to ask about rising national debt and falling value of dollars in the Q&A time. When it was over, though, I became completely disinterested in what they had to say. Because it doesn’t matter how intelligent they sound if none of their suggestions didn’t get executed and most likely they weren’t. Funny thing was a survey questions by KAEA (or could be that newspaper). It was asking very specific questions about exchange rate, gas price, when the economy would turn around, etc. Geez. When even economists do not know, how can we? But, I also found out that that only applied to us. The rest and majority of participants were all “distinguished” economists from Korea. I didn’t know that, and I certainly wouldn’t have guessed it from their conversations. They all just talked about each other’s hair style, alma mater, etc. Really? Is that why you flew all the way from Korea? I did ask a few folks what they thought about the whole economy, but they had the typical “you are not worthy of my conversation” attitude. Wow. Most of these guys were from higher education institutions and public research groups, and none came with their own personal money. At the end, they all talked about where to go and drink. No wonder Korea’s economy is so f-ed up (well, besides the whole global recession thing).